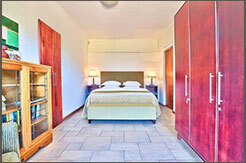 Self-catering Strelitzia Flat is the perfect accommodation solution when visiting Cape Town. Nestled in the Hout Bay Valley, the house is in a quiet area but close to the entertainments of the nearby village and greater Cape Town. The comfortable and tastefully decorated flat boasts two double bedrooms (one en-suite the other with a separate bathroom), a lounge and kitchen area, as well as a peaceful garden with pool and braai facilities. There is off street parking and the house is situated within Hout Bay. A maid service can be arranged and there are laundry facilities on the premises. Make Strelitzia Flat your choice when on holiday or business in Cape Town.